Keep tracking of accurate rankings, from 700+ search engines, 46,000+ locations all over the world, everyday. Keep your clients up to date with automated reports sent to their inbox. Create and share shared reports via URL with your clients. Set custom domain & logo, configure your dashboard to look as though it is your own. 100% brandable reporting & dashboard. Track keyword rankings daily on major search engines including Google, Bing, Yahoo and Yandex from multiple devices. Monitor rankings on a country / region / city level from all over the world. Designed for SEO agencies, schedule automated rank reporting for your clients, with your own company logo and name. 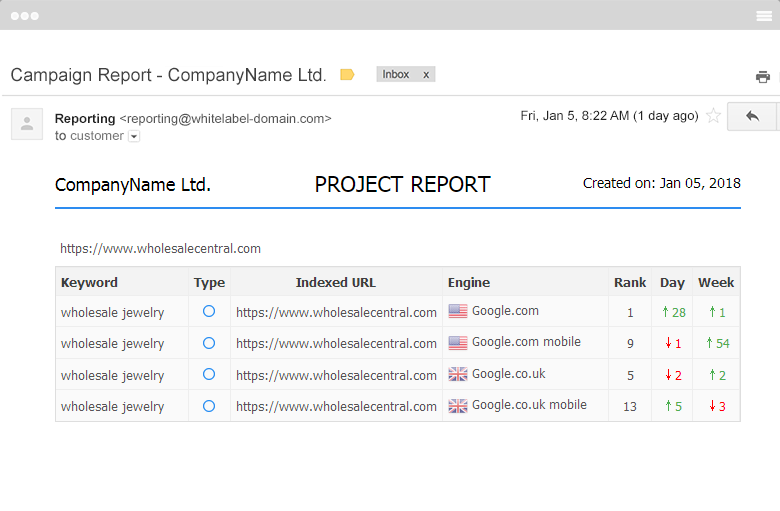 Share project reports via URL, your clients will view reports on your own domain. SEO Agencies, Website Owners, SEO Professionals. 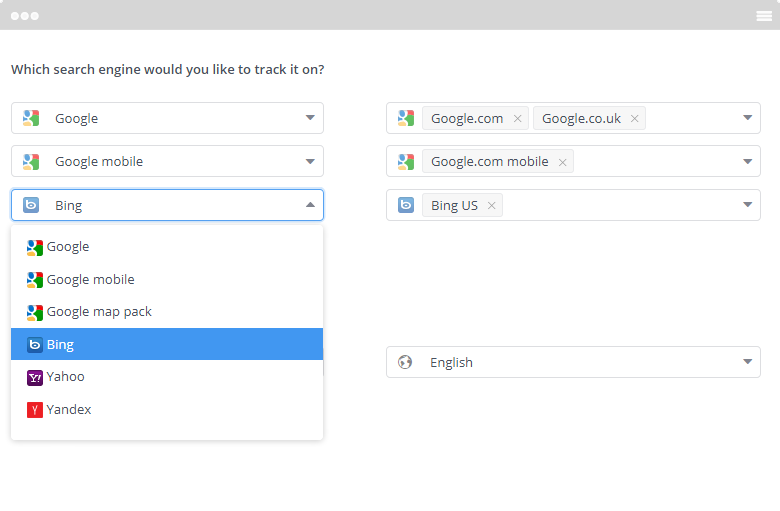 Keep tracking of keywords based on the country / region / city where your client's business is located. Prove your value to clients with white label reportings sent from your branded email address, or viewed at your domain. Create sub accounts with specific permissions. They will login and mange projects at your 100% branded dashboard. Analyze a competitor, get its top ranked keywords, and metrics including search volume, competition, cpc for keywords. Analyze keywords, get related, similar keywords, and metrics including search trend, competition, cpc for keywords. 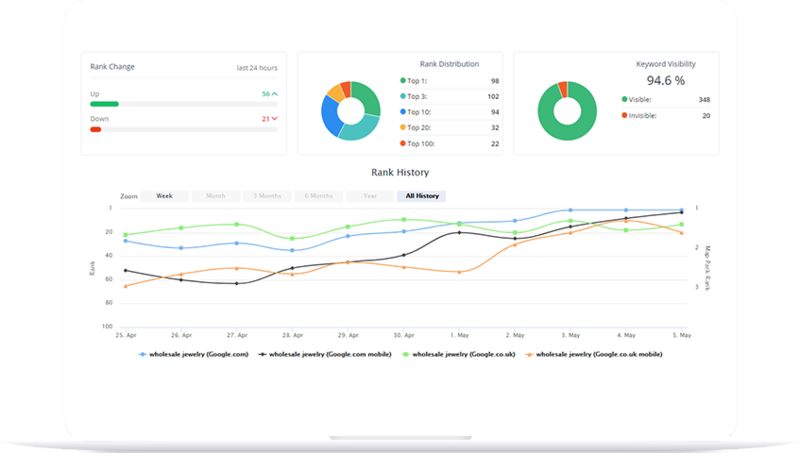 Integrate Rank Checker, Automated & Shared Reporting into your own platform, get search engine rankings programmatically. Need a customized plan? We offer Bespoke plans for agencies, contact us for more details. We accept credit card (Visa & Master Card) and PayPal. Can I cancel subscription at any time? Yes, you can cancel your subscription at any time. You will not be billed any longer when your subscription cancelled. Do you offer discount for a yearly plan? Yes, subscribe or upgrade to a yearly plan and get 10% off! Yes. You can upgrade your plan at any time. You are only responsible for the difference. Can I track Google mobile / map results? Yes, we support tracking for Google mobile / map results too. Can I remove CheckSERP branding from reports / dashboard? Yes, you can remove all references to us and show your clients your own company domain, name and logo if you choose plans with white label feature. How many websites can I track? We don't limit the number of websites you can track as other rank tracker companies do. You can track as many sites as you wish as long as there are available term credits left in plan. Do you offer any plans larger than Business? If you need more keywords, reports or anything else and need a larger plan, please contact us for custom pricing. Please visit our Knowledge Base, or contact us for more help. Have a question, feedback or suggestion? Please feel free to contact us using the form below.